The 30th Soreen Stanbury Splash. Sunday 20th Jan 2013. FRA Category BM race. 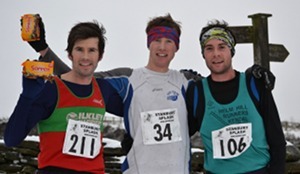 Starts 11.30 a.m. From Penistone Hill Country Park, nr Haworth, Keighley, W.Yorks. (GR 025364). (Registration in the cricket club near the quarry.) £4 entry on the day only. Teams (3) free. PM. Over 18. Records: 41.53 I.Holmes 2006; f. 49.01 N. White 2006. 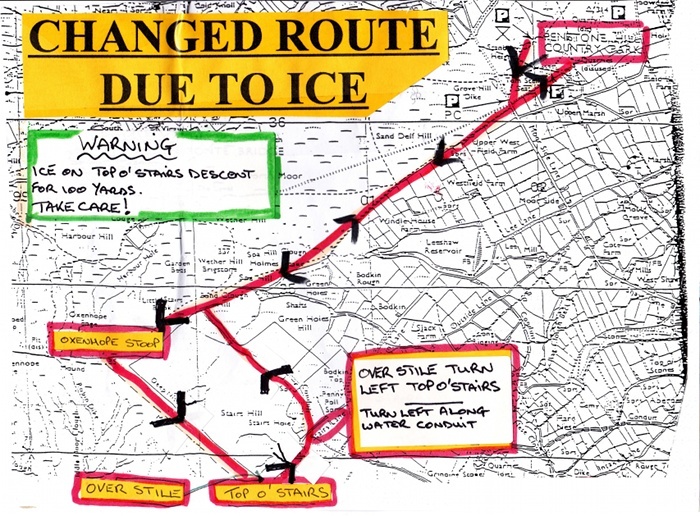 Tomorrow's 30th Soreen Stanbury Splash race will be going ahead with a changed route due to Ponden Kirk being too exposed to ice and snow. The changed route will now be the 2003 Auld Lang Syne race route, which was a frying pan shaped route, taking in the Stoop standing stone, Top O' Stairs, Water Conduit and return via rejoining the Stoop ascent. The distance is now 6miles/900ft, which will allow Over 16 athletes to compete. Sarah Rowell's ladies course record time of 40-05 set in 1995 will be nigh on impossible for the men's winner to get near given the conditions.....or is it? The men's record is 34-01 by Ian Holmes in 2003, no way, no how!! Junior races are not affected and will go ahead as normal. All other details are the same as before, the cricket hut is set, hot coffee and biscuits are awaiting you all, the Malt Loaves are ready to be eaten, prizes are in the pub, the roads are clear and early tomorrow morning we will be gritting the track on to Penistone Hill - please take care though! The junior Soreen Quarry Runs will see all category winners receive a signed picture of Olympic medallists Ali & Jonny Brownlee, a pack of Curly Wurlys, a malt loaf and a prize off the table. Second and third in each category will receive a Soreen malt loaf and a prize off the table. There is also six fancy dress prizes on offer for those wanting a little more fun. No matter what, all junior runners will receive a Soreen goody bag containing a race certificate, a Soreen lunch box loaf, a Curly Wurly, a Flump, a mini bag of Haribos, a painter lolly, a sherbet filled straw and a bag of Monster Munch along with a carton of juice to wash it all down with. Finally don't miss out on the famous chocolate/Soreen throw out.